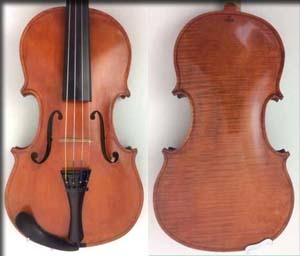 James started making instruments in 1980 and began full time in 1995 when he began the 3 year violin making and repair course in the Newark School of Violin Making, Nottingham, England. He set his workshop up in Stoneybatter, Dublin where he makes violins, violas and cellos. Callers are welcome to the workshop but do make an appointment first. James uses selected master grade maple from Bosina and Slovaki for the backs of his instruments and master grade Swiss pine or sitka spruce for the belly. He also uses plate tuning techniques developed by C M Hutchins in the 50s and is an agent for the ground breaking adjustable carbon fibre soundpost 'Anima Nova' which enables an instrument's vibrations to be perfectly synchronised. For more information on James' work and information on fitting the carbon fiber soundpost to your present instrument contact him through the James Beatley website.